This is a modern cottage with a traditional twist. Perfectly situated for easy access to the City centre and the M4 motorway. There are many local historic places of interest as well as being very close to both sandy and pebble beaches. Exceptionally well presented, with excellent fixtures and fittings- a real home from home. Lovely private terrace where you can on a good day watch the wildlife. Ample parking for at least two cars right outside the front door. Electric gated entrance to driveway. Although this property is next to our home, it has total privacy. Access is via electric security gates. The surroundings are peaceful and private yet close to main roads with a local pub within a good walking distance. It’s a short journey to Cardiff City centre and many other attractions eg beaches, Cardiff Bay, Welsh Folk Museum, Dyffryn Gardens, and so much more all within less than ten miles. Peaceful location and very close to the Cardiff City Centre with the convenience of being at most locations in very little travel time. Tinkinswood and St Lythans burial chambers closeby with St Lythans Church thought to date back to 13th Century 3 minute walk away. Dyffryn Gardens and house (National Trust) approx 3 mins by car. Bathroom 1. Shower room serves the ground floor bedroom with large walk-in shower, W/C, bidet & vanity unit. Bathroom 2. Large en-suite to first floor bedroom with bath, W/C & basin. Ample drawer space and walk-in wardrobe. Bedding supplied. Towels are only supplied to overseas visitors. However, if forgotten can be provided at small additional cost. Outside line and clothes horse. Electric gates into property and Private parking for 2 plus vehicles. Spacious living/dining room with 2 large sofas, large flat screen Panasonic T.V. with built in digital Freeview. There is also a variety of reading material. There is a French door leading onto patio area, that has a fantastic view (please see pictures). Electric grill and Hob in addition to Rayburn Cooker. Various teas, coffee, sugar and other basics eg, salt, pepper, vinegar, olive oil. Visitors have commented ‘home from home’ with the varied amount cooking utensils and dishes that anyone should need. Dining area overlooking patio garden with lovely views. More dining chairs available should you have guests coming for a meal. Large screen Panasonic TV in lounge and wall mounted tv in main bedroom. There are a number of top golf courses within 3 miles of property. Outside: Enclosed Patio area including barbecue and table and chairs. Utility Room: Washer iron and ironing board, airing cupboard and line Cleaning /bedding supplied Towels will be supplied to overseas guests or those travelling by public transport. Additional housekeeping, babysitting & driver are all available upon request. Other: No dogs Non-smoking. Cosy, warm, comfortable and very well appointed. Lovely views. Friendly hosts, helpful if needed. What a beautiful place , wonderful hosts. Everything needed for a great holiday. My wife, two daughters and I stayed for four nights between Christmas and the New Year. The cottage is in a lovely rural location, but is within quick driving distance of some very good local supermarkets, restaurants and cardiff city centre. 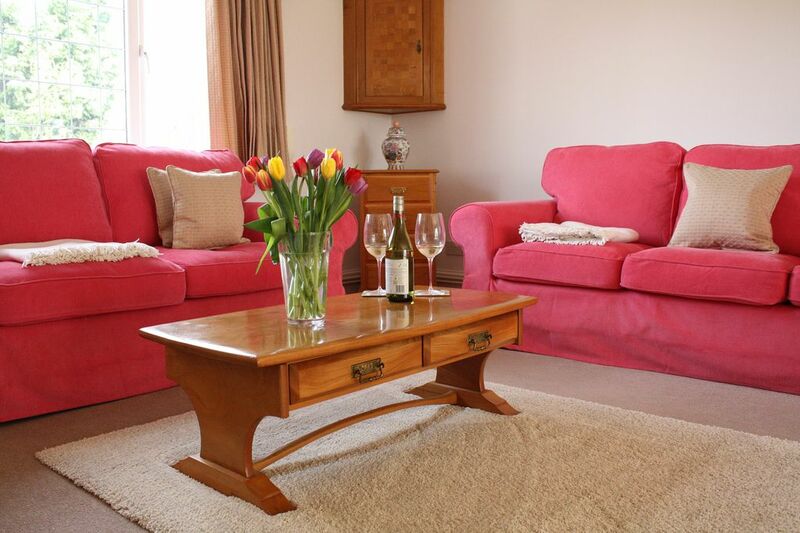 Wendy is very friendly and welcoming and the cottage is very cosy and inviting. The accommodation is spacious and Wendy has done a lovely job with the fixtures and fittings. We all throughly enjoyed our stay and would highly recommend. Brilliant - a home away from home!! This cottage is fantastic - it is in a country setting but also very close to Cardiff with many options for getting to the city centre. Wendy and Ian have made a beautiful home where you won’t want for anything. Sadly we were only there 3 nights, however would have stayed longer if we could. The cottage is also close to many attractions such as St Fagans, Cardiff city centre, Caerphilly Castle, Penarth, the Vale of Glamorgan to name a few. The cottage is beautifully furnished, comfortable, has a lovely outlook over fields and our hosts could not have been more hospitable. Will definitely return if we are ever back in Wales. Really pleased you enjoyed your time in Wales, you certainly made the most of all the sights locally. Shame you didn't have much time to relax and enjoy the cottage a little more. It would be a pleasure to welcome you back however, appreciate Australia is not round the corner!!! Nearest beaches are Porthkerry Park, Barry Island and Cold Knap all approx. 6 miles away. Cardiff Bay and it's attractions are a similar distance (6 Miles) virtually a direct route into city centre. Swansea Marina is some 38 miles. Nearest Airport is Cardiff Airport approx. 8 miles away. Nearest shopping outlet - Marks & Spencer, Tesco Extra etc. The Roman market town of Cowbridge is well worth a visit, however Cardiff has an extremely diverse mix of things to offer, such as Cardiff Castle, Cardiff Museum, The Waterfront and it goes without saying a wealth of shops. Booking Notes: 20% deposit required upon booking. Full payment required 14 days prior to your stay. Arrival time after 3.30pm. Depart time by 10.30 unless previously agreed Cancellations carry a 20% charge or full payment if within 1 month of the start of the reservation. If we re-let, you will not be charged. Changeover Day: Saturday but can be flexible depending on availability, additional charge if short stay crossing over a two week period eg Thurs to Sun Arrival time after 3pm Vacate by 10.30am Notes on prices: Per night rate is from £103 per night. Bank holidays will be charged a higher rate also a Friday to Monday weekend booking during peak season overlaps two weeks. For long term rates please ask.